Brakes fans and players alike will surely be glad that FA Trophy draws permitting, they will have seen the last of Worcester City this season after two swift second-half goals sent them away from Aggborough empty-handed again, writes Paul Edwards. 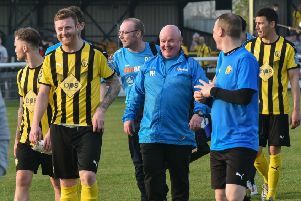 The performance was greatly improved from the FA Cup defeat but Danny Newton’s late header was all Leamington could take from a game they deserved at least a point from. However, they were indebted to on-loan Derby County stopper Mats Morch for a string of outstanding saves to keep the hosts at bay until the closing stages. A bright opening from Leamington saw a couple of half-chances pass by, Jacob Rowe picking up an early booking for Worcester after Stefan Moore got the better of him on the right. One of several early corners saw Graham Hutchison well placed on the line to clear Jack Edwards’ goalbound header, while a superb challenge on Daniel Nti by James Fry prevented the striker from finishing off George Williams’ low driven ball into the box. Morch was then called into action, denying Williams twice in quick succession with fine reactions to first keep out a low drive and then to claw away the follow-up header. Brakes suffered the loss of the influential Jordan Goddard just past the half-hour when the midfielder was left poleaxed by a flailing elbow from Nti. There was major concern among the travelling support as the former Bristol Rovers youngster was stretchered from the pitch and eventually emerged from the first aid room to climb aboard a waiting ambulance at half-time. Danny Jackman had a shot deflected behind and City skipper Ellis Deeney’s free-kick sailed high over the Leamington goal, while Fry’s 30-yard effort was held by Nathan Vaughan as Brakes steadied themselves after a shaky period having lost Goddard. Newton met a free-kick at the far post early in the second half but his shot struck substitute James Mace and went behind. Jackman then cleared Mace’s header off the line before Worcester made a double substitution. One of those introduced, Jordan Murphy, charged into the box, forcing Morch to make a brave save at his feet. The visiting keeper was then called on to make an even better stop as he dived to keep out Connor Gater’s effort. Brakes could not clear the resulting corner kick, however, and Nick Wright forced the ball home to put the hosts ahead. Within minutes, a cleverly worked free-kick routine saw the dead ball whipped in to the near post where Hutchison flicked the ball past Morch to double the lead. Stephan Morley crashed a shot across goal from a neat flick by Moore, but atoned for his miss by finding Danny Newton with a well-placed free-kick from the right wing, the unmarked striker giving Vaughan no chance with his stooping header to make the closing minutes more interesting. However, the closest Leamington came to an equaliser was from Mace’s header from just inside the box which looped straight into Vaughan’s hands. Worcester City: Nathan Vaughan, George Williams, Tyler Weir, Graham Hutchison, Jacob Rowe, Danny Jackman (Connor Gater, 62), Daniel Nti (Tristian Dunkley, 72), Ellis Deeney , Mike Symons (Jordan Murphy, 62), Sean Geddes, Nick Wright. Subs not used: Shabir Khan, Daniel Kier. Leamington: Mats Morch, James Fry, Stephan Morley , Jordan Goddard (James Mace, 33), Jamie Tank, Stuart Pierpoint, Matt Dodd (Aron Wint, 87), Jack Edwards, Stefan Moore, Danny Newton, Lee Chilton (Lee Moore, 87). Subs not used: Luke Connolly, Liam Maher.